At first I thought this center door had an interesting grill. Then I noticed the front springs. What's up with that? I like accessories but those springs I have never seen before. Radiator grill I have seen before. 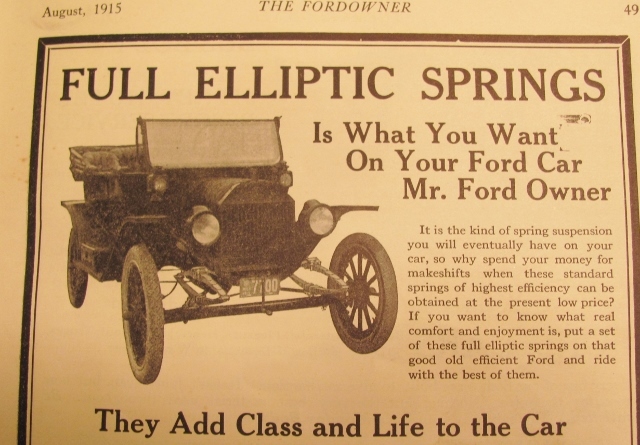 Those springs are probably from a Franklin of that era. For those not familiar, Franklins used four full-elliptical springs --- two on front, two on rear --- without any sort of radius rod or perch poles. The driving force was through the spring itself. Amazing that they worked as well as they did, for they gave the car about the softest, smoothest ride of any car at the time. 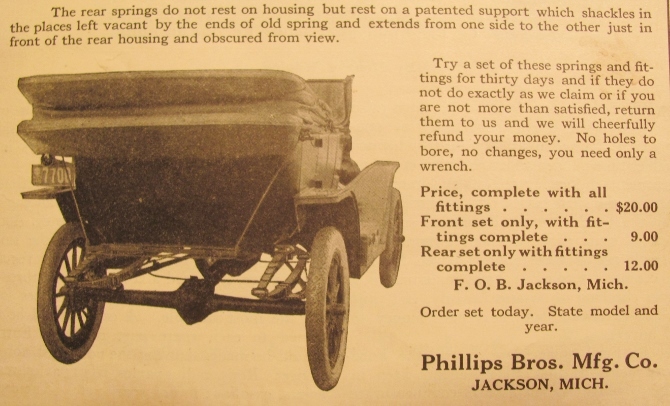 Franklin springs on a Model T is an intriguing thought. With the Ford radius rods on both axles, there's no reason why it shouldn't work. Although I doubt it would be as robust as the Ford system. Center-door sedans tend to pitch and sway a lot. That would probably make a more stable ride. Always good to hear from you, Lance! i don't see any fish. If someone could think it up back in the T days, it happened! As an ex Missouri hobby farmer I like Fords spring arrangement. 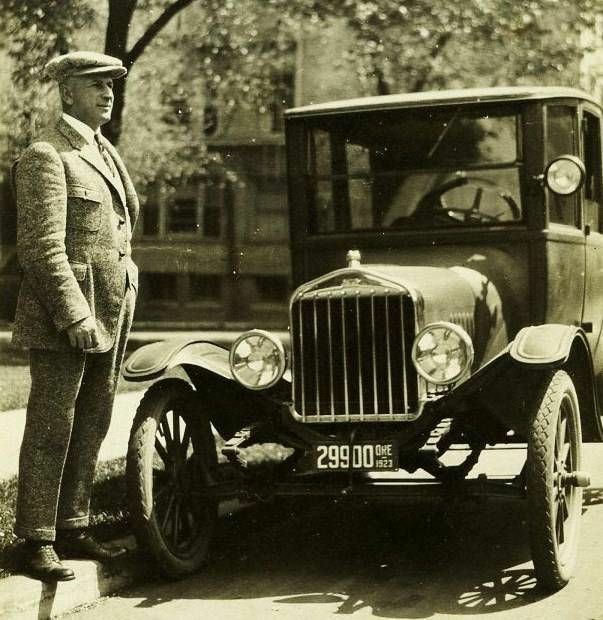 I will confess that I don't have a Model T yet but I do have a 28 Model A open pickup that I used when on my farm to water newly planted trees on my 800 foot driveway. I bought a plastic 4x4x4 foot container that they ship all kinds of stuff in. Mine was for pickle juice. There was a guy near me that raised thousands of acres of cucumbers and supplied most of the little quartered pickles that we get when we go to a restaurant. The trees seemed to love the pickle flavoured water. I would drive down the driveway back and forth across the drainage ditch beside the trees and marvelled at how the chassis would twist with the two point attachment it worked really well. The hood is after market also. i suppose that's the proud owner standing beside it. Looks like there is a ghost behind the steering wheel. Those springs would good on a speedster. I have thought about building a speedster and using the springs from a early 1920s Chevy frame. I think that would be an interesting look. Now that really takes away from Henry's 3 point suspension design, looks very limited in free travel now. I'm guessing you couldn't drive that one over a huge dirt bank anymore like we've seen in the old films, I'd bet it would turn over.